Also referred to as Huntsman fluted display, Estate Agents Board and Corex board. Correx Fluted display Board or Estate Egents Board is available in 4mm and 6mm thickness boards. This is a twin wall Fluted display board made of polypropylene plastic sheet that is lightweight, cost-effective and recyclable, perfect for indoor and short-term temporary outdoor use up to six months. Correx can easily be drilled, riveted, nailed, be attached by suction cups, glued, double sided tape, hung or Velcro backed, and even staple gunned. 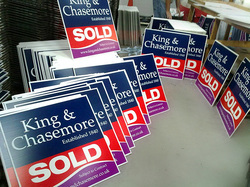 By far the most popular way is staked as per estate agent "for sale" signs. Double sided printing onto Correx is also possible. Please Note: Due to the fluted board structure you can usually see faint horizontal lines running across the display. Correx is not as rigid as Foamex or Dibond.